To shower His grace on His children, the Compassionate God will reduce His infinite power and imprison Himself in the little frame of the human body made of five elements and live with us. How blessed are we, the individuals, who receive such a glorious opportunity! 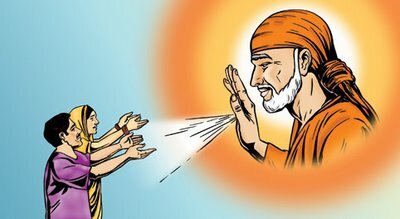 They are blessed who saw God Sai with their own eyes, touched Him with their hands, heard His words, talked to their heart's content with Him and received the sanctified food served by Baba. When grief wells up in one's mind that one was not alive to be with Baba, Baba appears in one form or the other to His devotees saying "I am with you even now". True devotion is the pre-requisite to get blessed by Baba.Elders say that devotion means service and pure love for God. Mhalsapathy did not ask for any boon from Baba. He felt that he was in Baba's presence always. It is supreme love of a devotee. Mhalsapathy, indeed, experienced unalloyed bliss by Baba's Grace. Though Gadadhara was not literate, he ardently prayed for God-realization. Guru Tothapuri guided him on the right path. Innocent Gadadhara was, thus, transformed into Sri Ramakrishna Paramahamsa. Devotion devoid of a steady mind is of no use. If one surrenders to the All-Merciful God in total love and devotion, God Himself will get self-imprisoned in the hearts of such ardent devotees and liberates their fettered.